Dry Cell Battery Poisoning is the accidental or intentional intake of any dry cell battery or battery parts. The exposure may also be through smoke inhalation while burning the batteries. What is Dry Cell Battery Poisoning? Dry cells are used in calculators, remote-controlled or battery-operated toys, watches and clocks, flashlights, etc. What are the Causes of Dry Cell Battery Poisoning? What are the Signs and Symptoms of Dry Cell Battery Poisoning? How is First Aid administered for Dry Cell Battery Poisoning? Who should administer First Aid for Dry Cell Battery Poisoning? 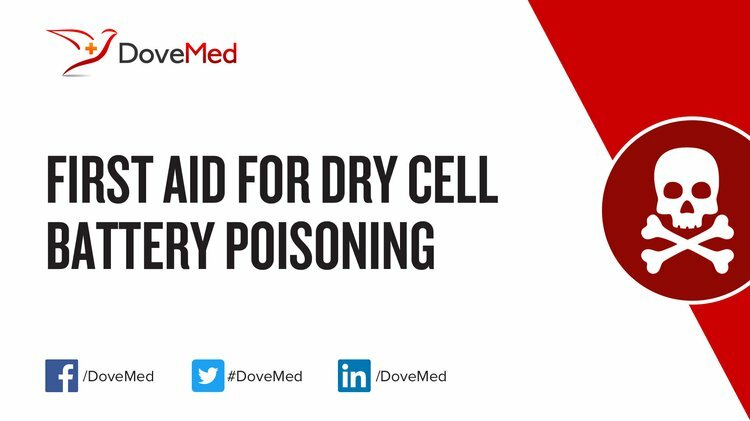 First aid for Dry Cell Battery Poisoning is administered by healthcare professionals. What is the Prognosis of Dry Cell Battery Poisoning? How can Dry Cell Battery Poisoning be Prevented? Johri, N., Jacquillet, G., & Unwin, R. (2010). Heavy metal poisoning: the effects of cadmium on the kidney. Biometals, 23(5), 783-792. Khilari, S., Pandit, S., Ghangrekar, M. M., Das, D., & Pradhan, D. (2013). Graphene supported α-MnO 2 nanotubes as a cathode catalyst for improved power generation and wastewater treatment in single-chambered microbial fuel cells. Rsc Advances, 3(21), 7902-7911. Urner, M., Schlicker, A., Z’graggen, B. R., Stepuk, A., Booy, C., Buehler, K. P., ... & Beck-Schimmer, B. (2014). Inflammatory response of lung macrophages and epithelial cells after exposure to redox active nanoparticles: effect of solubility and antioxidant treatment. Environmental science & technology, 48(23), 13960-13968. Takaoka, M. (2015). Mercury and mercury-containing waste management in Japan. Journal of Material Cycles and Waste Management, 17(4), 665-672. Kim, M., Jeong, G., Eom, K., Cho, E., Ryu, J., Kim, H. J., & Kwon, H. (2013). Effects of heat treatment time on electrochemical properties and electrode structure of polytetrafluoroethylene-bonded membrane electrode assemblies for polybenzimidazole-based high-temperature proton exchange membrane fuel cells. International Journal of Hydrogen Energy, 38(28), 12335-12342. Jeongbin, O. K. (2012). U.S. Patent Application No. 13/466,034. Mayavan, S., Sim, J. B., & Choi, S. M. (2012). Easy synthesis of nitrogen-doped graphene–silver nanoparticle hybrids by thermal treatment of graphite oxide with glycine and silver nitrate. Carbon, 50(14), 5148-5155. Michalak, B., Sommer, H., Mannes, D., Kaestner, A., Brezesinski, T., & Janek, J. (2015). Gas evolution in operating lithium-ion batteries studied in situ by neutron imaging. Scientific reports, 5, 15627.